The Minister for Manpower, Lim Swee Say has announced plans to implement a mandatory Settling-in Programme (SIP) for new foreigners on work permit. Speaking at an appreciation dinner organised by the Ministry of Manpower (MOM) for more than 300 partners comprising employers, dormitory operators, non-government organisations, employment agency representatives, and foreign worker ambassadors, Minister Lim said the programme is expected to be launched in the second half of 2018 and will be rolled out in phases. The SIP will be rolled out in phases, starting with the construction sector. 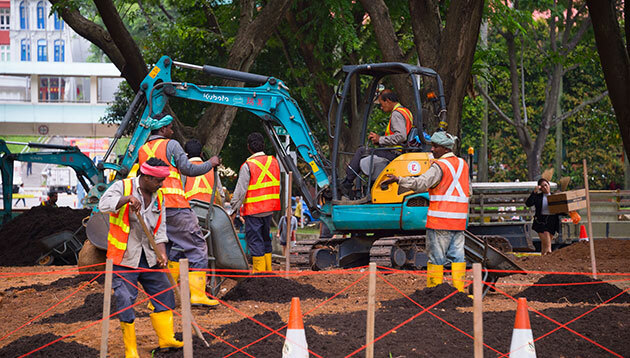 About 2,000 foreign workers in the construction sector are expected to attend the SIP each month. Employers will be required to register their foreign workers for the SIP, including bearing the course fee. Similar to the current mandatory SIP for first-time foreign domestic workers, this mandatory programme will educate newly arrived foreign workers on employment rights and obligations, Singapore laws and social norms, as well as avenues of help. It will be conducted in the foreign workers’ native languages as a formal, structured one-day programme to educate newly arrived foreign workers who are working in Singapore for the first time. Last year, MOM conducted a pilot programme with close to 1,900 foreign workers to ascertain the programme’s effectiveness. During a post-course evaluation, positive findings and feedback were received about the programme with almost all foreign workers more aware of their rights and responsibilities, understanding that MOM could help them when they had employment issues. At the same time, employers also saw an improvement in their foreign workers’ behaviour and shared that they had a more positive attitude at work.